Animal testing has always been a subject of much debate. On one hand, it allows us to determine if something is probably safe for humans. On the other hand, it’s injuring and killing the very animals that help us escape that same fate. Any way you look at it, be thankful you’re not a lab rat. Being a mammal, they share a similar physiology with us. They are also easy to breed and easy to dispose of. These characteristics make them the prime subject for testing the safety of drugs and treatments that might one day be used on humans. 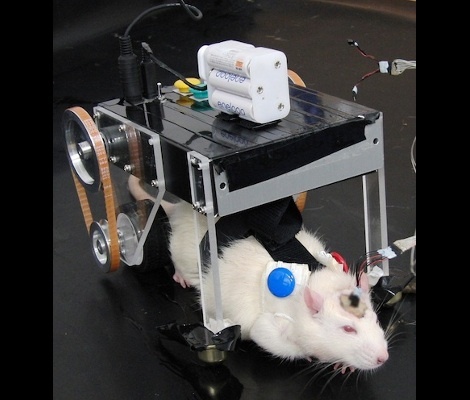 Scientists at Waseda University in Tokyo, Japan, have created a new rat nemesis – the WR-3, a robot designed specifically to stress and depress lab animals in the name of science. Depression isn’t normally something rats have to worry about in the wild. So, the WR-3 tries to instill it upon them. The robot has three functions: attacking continuously (relentlessly rams the victim), attacking interactively (attacks for 5 seconds whenever the victim moves, then stops), and chasing (stays right next to the victim but never attacks). The scientists found that the best way to make the rats depressed was to attack them continuously in their youth, then attack interactively as they get older. With the data the scientists gain from these new experiments, they hope to learn more about human depression and hopefully come up with more successful treatments. There isn’t a lot of specific information we could find about the WR-3, but we’ll keep you posted. [Tobie] seems to have a bit of a rat problem. While most people would be inclined to simply buy the oversized Victor spring-loaded rat traps and call it a day, [Tobie] is a bit more humane. 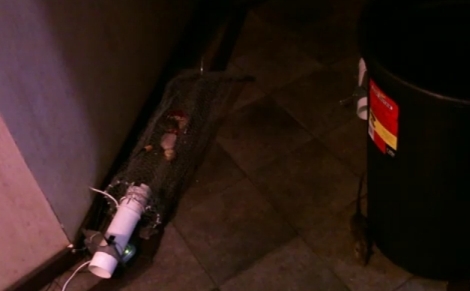 To help remedy his problem while also ensuring that no rats are harmed in the process, he built the Rat Trap 2000. Self-described as completely over the top, the Rat Trap 2000 lures the rodents into its containment area with apples and corn, securing them inside using a servo-actuated trap door. The door is triggered by an Arduino that monitors the holding pen for movement using an IR sensor. All of the action is captured on video using the web cam on his Eee-PC, as you can see in the very short video below. This certainly isn’t the most cost-efficient way to control your vermin problems, but if you’ve got some spare parts laying around, why not? It’s far more humane than some of the other rodent control solutions we have seen, and it sure beats living with rats! Sometimes we like to take a few minutes away from Hackaday to spend time with our families. But just when you take your eyes off of the incoming comments, Trolls are bound to strike. Well, [Caleb] and I found a solution to the problem in the form of a troll sniffing rat. This beady-eyed vermin sits on my desk and waits. 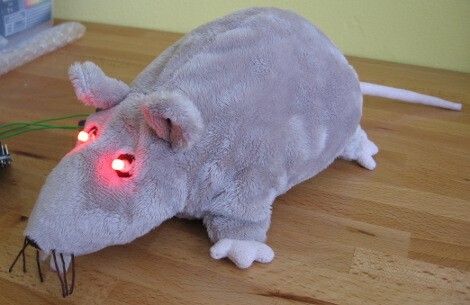 When a trolling comment is detected its eyes glow red and an alarm is sounded. Join us after the break for more about this silly project.